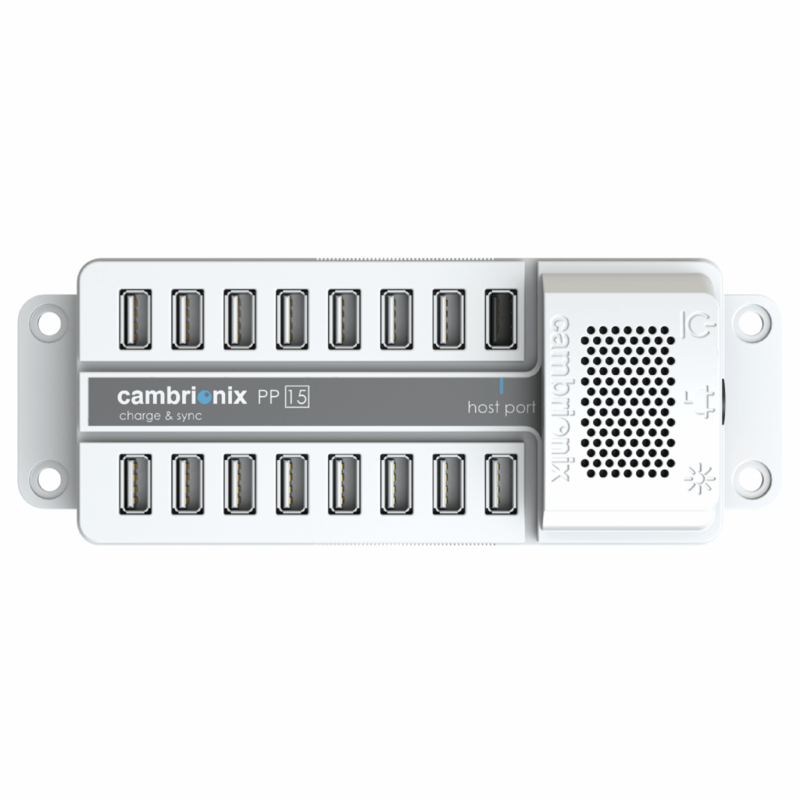 15 port universal USB sync and charge device. Sync and charge up to 15 iPads & iPad minis or any other tablet or USB chargeable device, simultaneously. Connection to a host computer, allowing the user to sync and charge up to 15 devices simultaneously. The PP15S is future proofed with updatable firmware administered through the host computer port. Simply connect to the website for free updates for new devices as they are released. 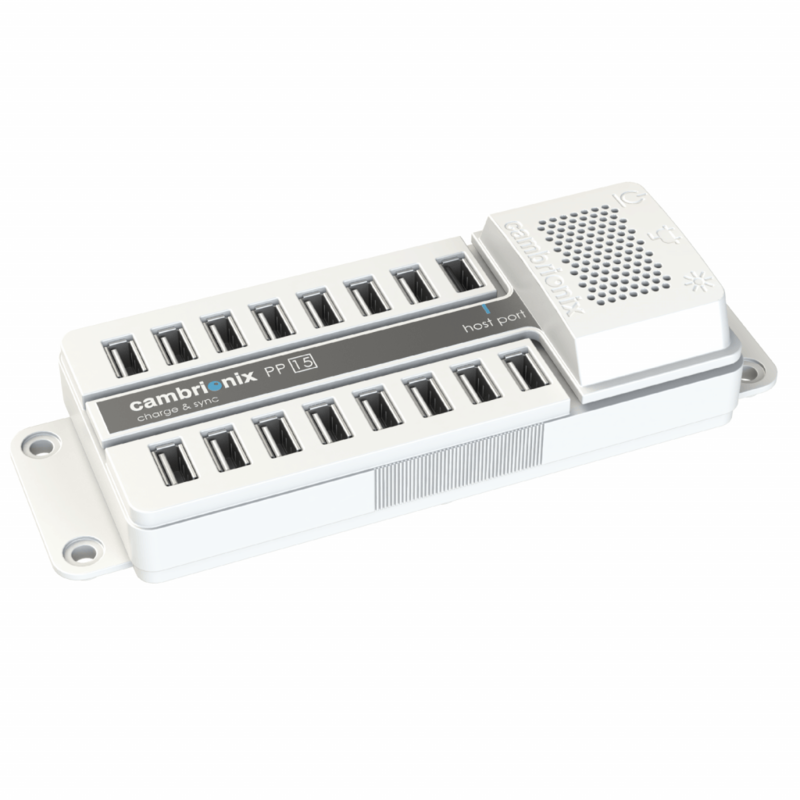 Charges up to 15 iPads, iPods or iPhones simultaneously up to 2.1A per port. Charges Amazon Kindle eBook readers (Fire and Black+White). Powers up to 15 Raspberry Pi or tablets for classroom use. Available as a charge-only or a charge & sync version. Perfect for tech centres, trade shows, travelling labs and training centres. Compatible with many other USB devices. Includes a UL-Listed dual voltage PSU. Mounts on or under a desk or counter. FCC and CB Test certificates available. Compatible Devices: Universal USB Charging. Number of Ports: 15 Ports. Charge per Port: 2.1 amps. Do you find that your organisation or place of work use a large number of electronic devices that need to be kept charged or charged and synchronized via USB cable? If so the PowerPad15S from Cambrionix is about to change your working life for the better. Many types of organisation find there is a need to charge and synchronise multiple devices: perhaps you are a school teacher and need to charge a whole class of tablets, or an IT technician charging devices for multiple staff members. Whatever the reason using the PowerPad15S will provide you with state-of-the-art USB technology that is compatible with every manufacturer model. 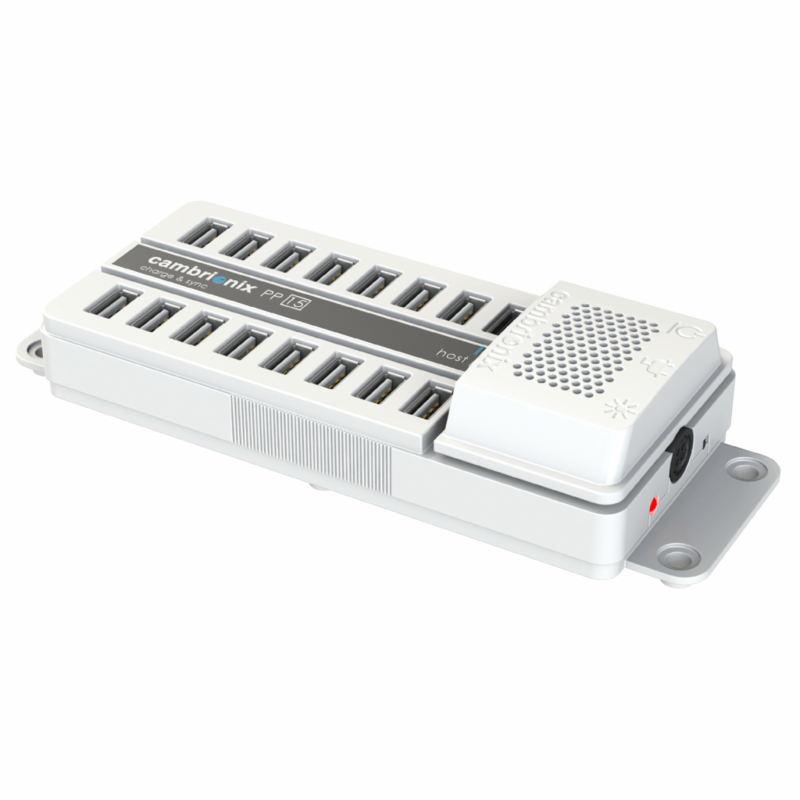 The PowerPad15S is light weight and can be mounted with screw fittings and comes complete with transformer.